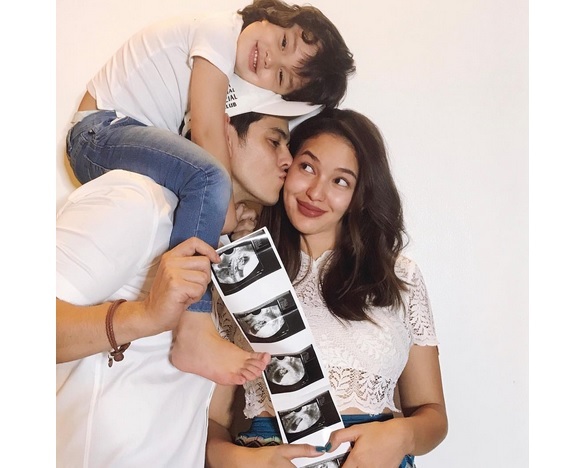 Baby number two is on the way for Richard Gutierrez and Sarah Lahbati! The couple made a big announcement on instagram, telling everyone that they are expecting their second child. On Monday night, Richard and Sarah both posted the same photo which shows them holding an ultrasound result, along with their four-year-old son Zion. Sarah captioned it: "We are thrilled to announce that our little family is growing. Zion is about to be a kuya!!!!! So excited for the future. Lord, thank you for protecting us. I'm very much pregnant... back pains, breakouts, HAKAW DIM SUM CRAVINGS, cramps, mood swings, ANNOYANCE 🙄 AT IBA PA!!" "The silver lining to this craziness is that there's a healthy baby growing inside of me who I'm very much excited to meet next year. :) Do you think we're having a boy or girl?" she continued. Richard, on the other hand, wrote: "We would like to thank the Man from above for another blessing. Our little family is growing and Zion is about to be a kuya!!! Thank you to my love @sarahlahbati for staying strong and patient despite my hectic schedule , she's able to take care of me, Zion and our little one on the way, she's truly a super mom. To our family, friends and supporters, thank you for the love, we are very excited for this new journey." Last month, the couple announced that they are officially engaged. They have yet to schedule their wedding.